Okay, so I am assuming you have done the basic tutorial missions. You haven’t? Well, do them! No arguments. They teach you the basic basics. What’s the difference between this and those? The same difference between driving lessons and road experience. One gets you a licence, the other keeps you alive afterwards. Docking at a station is a matter of finding the access corridor (letterbox), asking permission to enter, flying inside and then finding your landing pad to land on, preferably with landing gear down. When you drop out of super-cruise, you are for the most-part around 10km from the station. You cannot ask permission to land until you are less than 7.5km away, so get nearer! 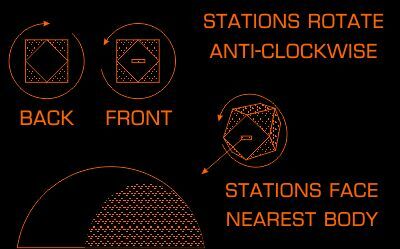 With Orbis (wheel) stations and Ocelus (Dalek eye stalk) stations, the end that is the front is pretty obvious – it’s the big end – but with the Coriolis stations new players have trouble finding the “front”. First thing to do is target the station – this is done for you when you request docking permission (see next paragraph for how). This causes your target hologram to display the station in orange (or green if you are classed as friendly). If you look carefully, on the sides of the station hologram are arrows which point to the front. The stations always rotate anti-clockwise, so if it’s turning clockwise you are at the back! If the station is orbiting a planet the entrance is always facing the planet. Get around to the front and then ask to dock. To request docking, you need to open the CONTACTS tab on your left-hand panel (press “1”). You then either get permission denied, because you are too far away (or on rare occasions the pads are all busy), or you are assigned a pad number and a 10 minute countdown starts. After which time, permission to land ends. Get lined up on the station’s centre of rotation – when you are new to the game it is easier to do this from a little further away. Match the rotation of the entrance and head into the station, staying on the green side of the slot. Remember to always enter and exit on the green side, no matter what way up you are. Once inside, pads are located in lines around the station interior like staves of a barrel. Your pad will be lit up with a holographic number. Loads are lit up? Found it? Good. Now land. Now you’ve found your pad, get lined up and drop your landing gear. You have to position your ship over the pad with your nose pointing at the back of the pad (where the number is displayed). You cannot land facing backwards. Stations are fussy that way! Get as close as you can, then slow right down. 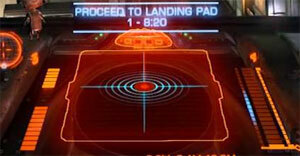 As you get near your pad, the ship's radar view changes into a hologram of your ship above the pad. You now need to use side thrusters and vertical thrusters to position your ship on the centre of the pad, so the HUD turns blue. Don't worry if you overshoot a little. Reverse back and try again. As soon as you are stationary, in the “blue zone” above the pad and you are low enough, the station’s magnetic clamps grab your ship and you are docked. Try and enter the station before asking permission. The station will start a countdown, after 30 seconds you are fined. If you are not out within 2 minutes, the station will kill you. 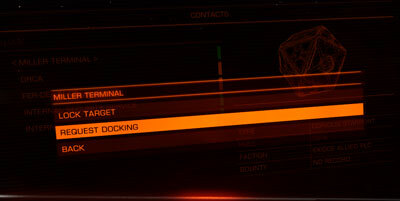 If you forget to request docking permission, stay calm. Stick the ship in reverse, or if you are in a small ship, fly though the entrance, flip over and fly out again. After you have had your wrist (or bank account) smacked by station control, you must wait 10 seconds before you can ask again for docking permission. When you leave the station you need to be aware of other traffic, station security and leaving the access corridor on the correct side. Don’t fire your weapons – the station auto-guns will ventilate your hide in seconds. That polite announcer is actually a psycho killer. Don’t give them any excuse. Don’t speed – if your gear is down, speed is limited – but if gear is up and your speed over 100m/s, any collision will result in a fine. Any serious collision will result in your summary execution. Don’t loiter around the pad, or inside the station. The timer that ticks from when you undock is how long you have before the station kills you. No polite warnings. When the time is up, you’re toast! The radar is your friend. It’s 3D. No really. Since 1984 no less. The triangle in the middle is you. The oval is an area around you. 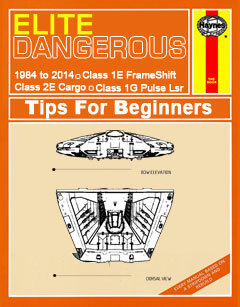 The triangle forward is representative of your forward view – what you can see out the cockpit window. Learn to read the radar. It’s important. Thanks to Rolf Thomassen for pointing out the block shape indicates hard-point deployment. When you fly out of the station access corridor (letter box) you don’t want to collide with the fast-moving lunatic in a super-massive Type 9 that will grind your Sidewinder to paste, so use the radar to look for ships in front of you heading toward you. Also, check behind. As you rise from the landing pad, there could be an Anaconda doing the same thing on the pad behind, whose pilot is reading GalNet and not looking where they are going! The coast is clear and you want to leave. But were you parked on the ceiling, or the floor, or the wall? No gravity means “yes” to all those answers. That presents a dilemma. If the floor is the wall, the wall is the ceiling, then which way up is the door? Well those clever bods in the Pilot’s Federation thought of this. Well, actually they borrowed the idea from sailors. When entering or exiting the station, keep right. That’s all. How do I know which side is “right”? There is a green light on that side and a red flashing light on the other. Red bad, green good. Got it? Cool. Chances of a head-on collision just went down a lot. Once you are outside, get clear of the station entrance. You need to be 5km away before the mass of the station stops locking your FrameShift drive from being able to jump. After that you are away! Q: The phone rings/baby cries/godzilla is coming and I need to quit the game in a hurry without leaving the station after I've taken off. What happens to my ship? 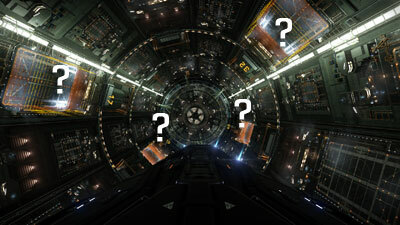 A: From the moment your ship leaves the pad, if you quit the game, then when you log back on, your ship will spawn, unharmed, 10km away from the station in space. You can either re-dock, or fly elsewhere.